Twin Cities Naturalist on the road! I spent last week in South Dakota. It was a family reunion trip for my wife' side of the family. All birding and natural history behavior thus had to be done in little stolen moments or while careening down the highway at 75 mph in a rented minivan. While I didn't return with a multitude of new western bird species sighted I did make some nice observations and saw a few lifers. Our first stop was Doland, SD. 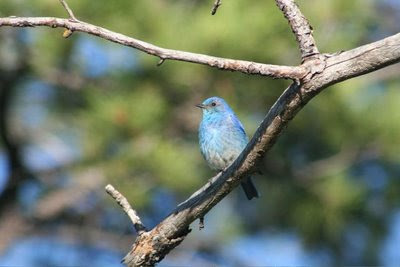 Aside from numerous mourning doves and house sparrows, there were some other birds hanging out at the edge of town. I quickly spotted a kingbird but even without my binoculars I could see the white stripe on the tail indicating that it was an Eastern Kingbird. I see the Eastern pretty much every day on my way to work. I was hoping to spot a Western Kingbird. I thought maybe we weren't far enough west. Realizing I had a few minutes while my son napped, I went inside to get my binoculars and camera. I was glad I did! The Eastern Kingbird was gone but it was replaced with a beautiful Western Kingbird just a short distance away. It stuck around for the two days we were there so it much have been nesting nearby. The Western Kingbird was a lifer for me. I walked along a row of trees and saw a bird fly in and land. 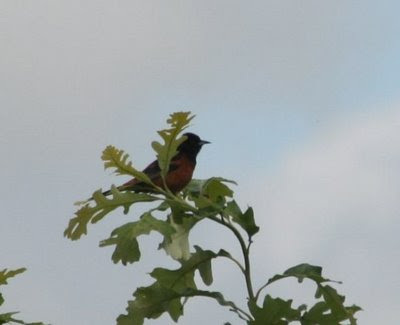 When I put up my binos I was rewarded with not only an American Robin but an Orchard Oriole. We have Orchard Orioles at home and we band them once or twice a year at work but I have never stumbled into one in the wild so this was a lifer for me as well. 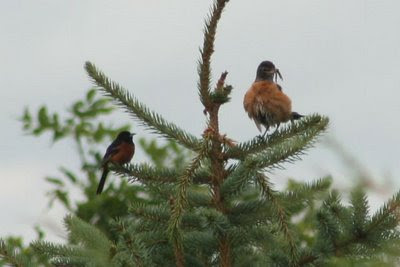 Here's a photo of the Orchard Oriole sitting next to the American Robin for comparison. The Orchard Oriole is smaller than a Baltimore Oriole. It's also brick red instead of bright orange. Another difference is that the tail is all black whereas a Baltimore Oriole also has some orange on the tail. I also saw this Brown Thrasher in the same area. This would have been a lifer last year. For a while this was a nemesis bird of mine. I could never find them. Now, for whatever reason, I've seen something like three or four of them this year. While doing a little yard birding I heard a Western Meadowlark and followed the sound out to the road where he was perched on a power line. He was facing away from me so I didn't get any good photos. 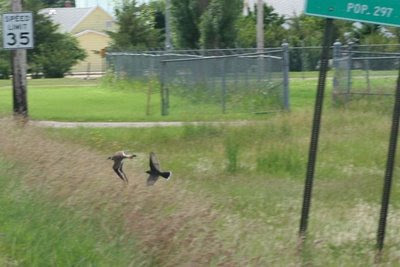 Out on the road it was fun watching the Western Kingbirds chase the Killdeer. 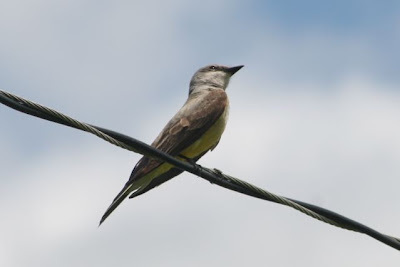 There were numerous killdeer around and the kingbird would chase after them if they flew under the powerline he was sitting on. I snapped a few photos of the pursuit, this was the only one that came out. They were moving really fast. You can see the bottom of the city's population sign, "Pop. 297" There are probably more birds than people. Heck, there are probably more house sparrows than people. We pushed on a few days later to the black hills for the family reunion. We narrowly avoided a forming tornado along the way. I had my eye on this storm cell for a while and as we drew closer I could see this interesting looking area on the tail end of the storm. When we got closer I could see little tendrils spiraling down out of this area. They would form and disappear pretty quick so I didn't catch them in photos very well. Luckily we were traveling perpendicular to the storm at 75 mph and we cleared the area without so much as a drop of water on the windshield. There wasn't really any time for birding when we reached the Black Hills but I did manage to see a Spotted Towhee outside the entrance to Sitting Bull's Crystal Caverns and a number of these gorgeous Mountain Bluebirds at the Rushmore Shadows Resort.